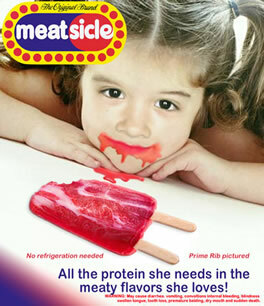 Popsicles Made of Meat? Who Could've Predicted? 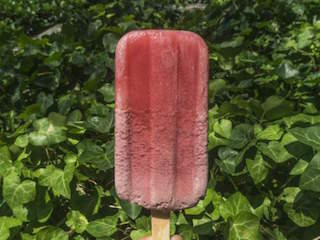 A New York City health food restaurant got the original idea to make popsicles made of meat. 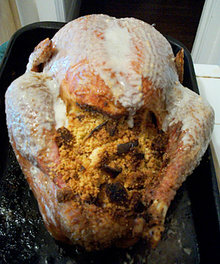 For all our U.S. friends who have just finished off their Thanksgiving weekend, one thing to be thankful about is that you weren't likely served a turkey stuffed with Twinkies. Curious? For April Fools Day, LivingSocial.com offerred up this amazing deal for a meat-themed med-spa, complete with video. A gingerbread house, without the gingerbread and way more meat. Inspired by Lady Gaga, Bruce Willis wears a "Meat Hairpiece" on the set of The Tonight Show with David Letterman. When my friend placed the piece of salami in the chocolate fountain, ate it, and told me it was actually pretty delicious, I didn't believe him. But trying it for myself, it was true that the salty meat went well with a chocolatey coating. Interesting. 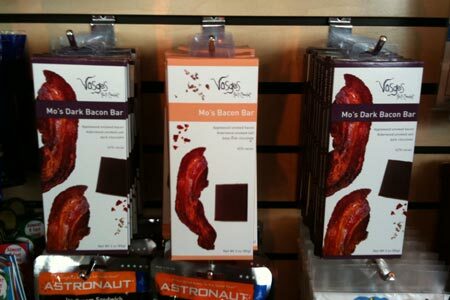 Even more interesting are Mo's Bacon Bars (a blend of applewood smoked bacon and chocolate) created by Vosges. Mmm. This is definitely a weird one, but (in a way) for both our meat eater and vegetarian readers. A house made of meat sounds horrible, but what if it was a victimless structure? What if the meat used to construct the house was grown in vitro, in a lab? Okay, yes, it's still somewhat horrible. But not nearly as horrible as the idea of using sphincter muscles that can open and close for windows and doors. How do you get it to open? Just a little tickle near the edge, obviously. 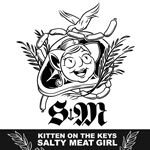 Kitty On The Keys - "Salty Meat Girl Blues"
Aside from salty meat, I'm not exactly sure what Kitten is into, but you can learn more about this San Francisco bay area singer on her website. Or feel free to creep her Flickr account for all sort of strange surprises (although suspiciously devoid of meat). Sometime around April-May 2003, one of the great sites of the internet disappeared: HATS of MEAT. In order to provide this meaty entertainment to the masses, Meatsicle hosted a copy of the HATS of MEAT site that was recreated using the magic that is the internet. In the drawer where they always are. I don't know, where did you leave them? In my hand, I've been running with them. Hey, what's that you have in your pocket? A bit of lint, some change, and a condom. Nothing, I'm just happy to see you.